Europe’s history making Rosetta cometary spacecraft has been granted a nine month mission extension to plus up its bountiful science discoveries as well as been given the chance to accomplish one final and daring historic challenge, as engineers attempt to boldly go and land the probe on the undulating surface of the comet its currently orbiting. If all continues to go well “the spacecraft will most likely be landed on the surface of Comet 67P/Churyumov-Gerasimenko” said ESA to the unabashed glee of the scientists and engineers responsible for leading Rosetta and reaping the rewards of nearly a year of groundbreaking research since the probe arrived at comet 67P in August 2014. 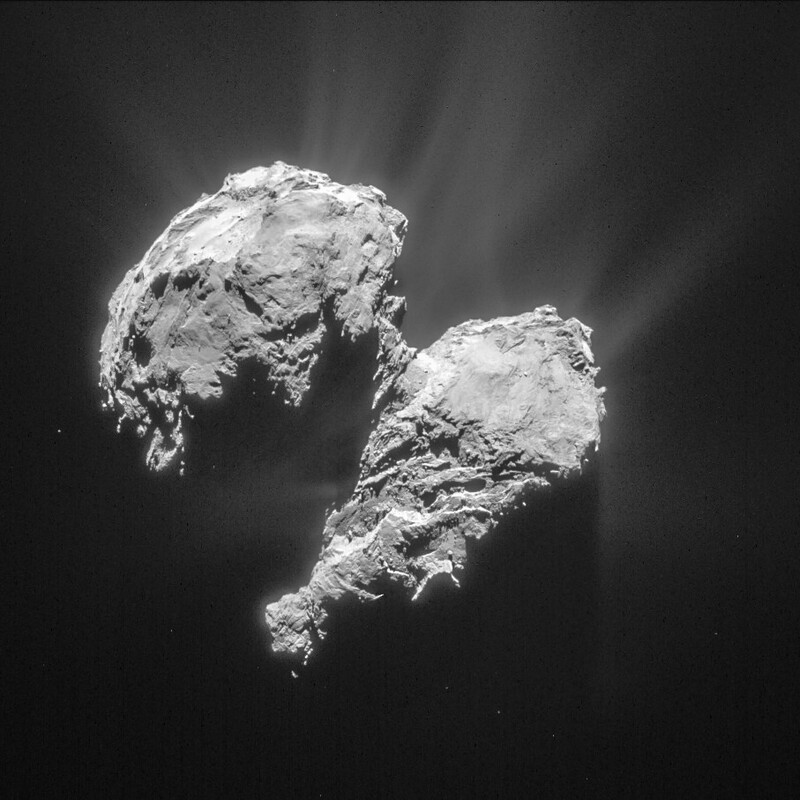 “This is fantastic news for science,” says Matt Taylor, ESA’s Rosetta Project Scientist, in a statement. It will take about 3 months for Rosetta to spiral down to the surface. Since then, Rosetta deployed the piggybacked Philae landing craft to accomplish history’s first ever touchdown on a comets nucleus on November 12, 2014. It has also orbited the comet for over 10 months of up close observation, coming at times to as close as 8 kilometers. It is equipped with a suite 11 instruments to analyze every facet of the comet’s nature and environment. Currently, Comet 67P is still becoming more and more active as it orbits closer and closer to the sun over the next two months. 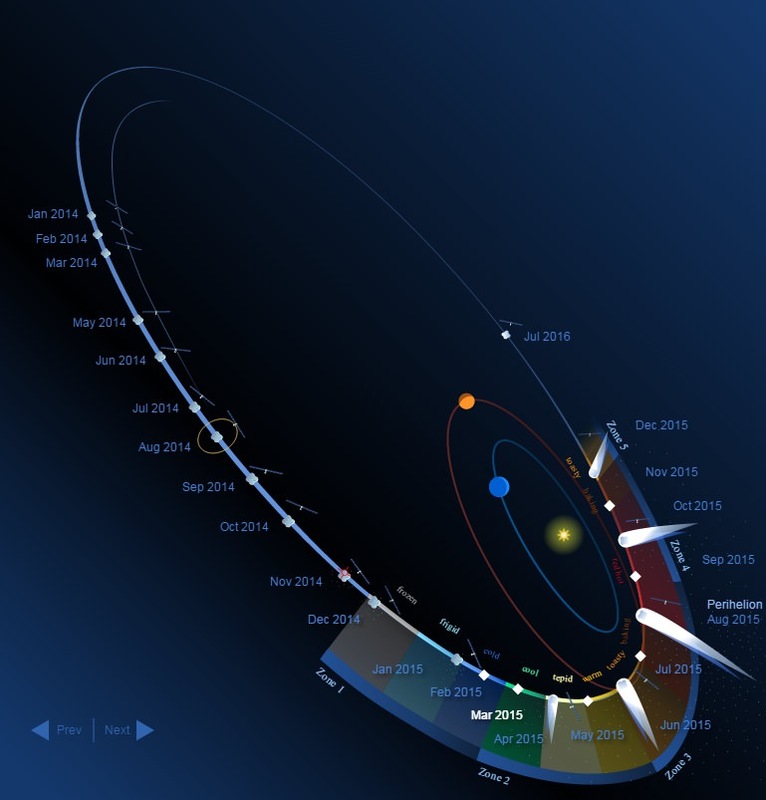 The mission extension will enable researchers to a far greater period of time to compare the comets activity, physical and chemical properties and evolution ‘before and after’ they arrive at perihelion some six weeks from today. The pair reach perihelion on August 13, 2015 at a distance of 186 million km from the Sun, between the orbits of Earth and Mars. Because the comet is nearly at its peak of outgassing and dust spewing activity, Rosetta must observe the comet from a stand off distance, while still remaining at a close proximity, to avoid damage to the probe and its instruments. Furthermore, the Philae lander “awoke” earlier this month after entering a sven month hibernation period after successfully compleing some 60 hours of science observations from the surface. As the comet again edges away from the sun and becomes less active, the team will attempt to land Rosetta on comet 67P before it runs out of fuel and the energy produced from the huge solar panels is insufficient to continue mission operations. 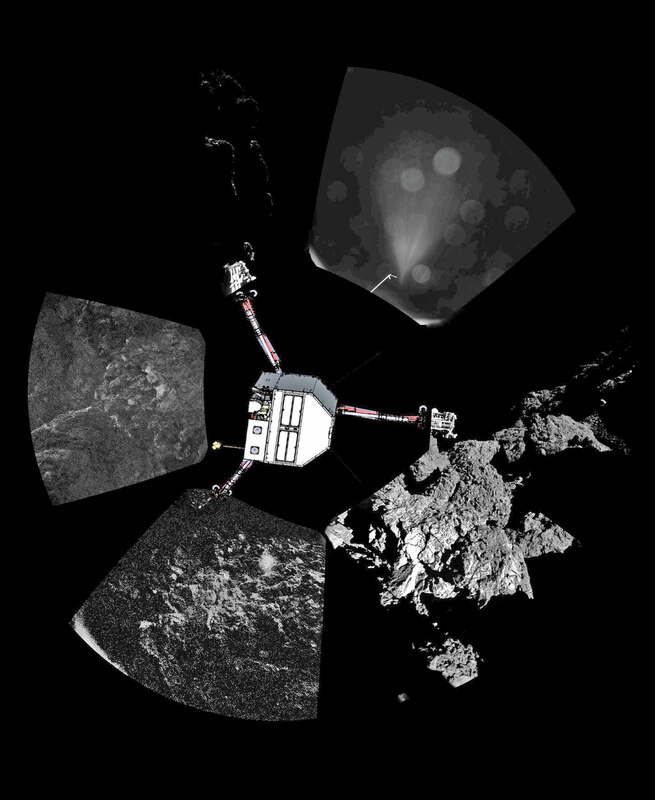 During the extended mission, the team will use the experience gained in operating Rosetta in the challenging cometary environment to carry out some new and potentially slightly riskier investigations, including flights across the night-side of the comet to observe the plasma, dust, and gas interactions in this region, and to collect dust samples ejected close to the nucleus, says ESA. 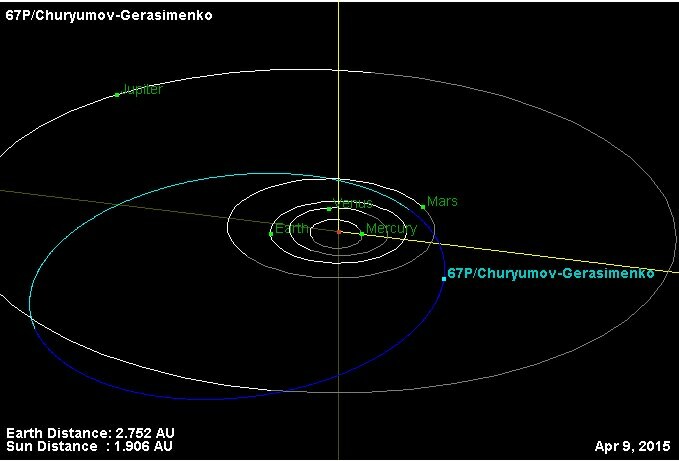 Calling all light-bucket scope owners: the folks at the European Space Agency want to enlist you in the quest to monitor Comet 67P/Churyumov-Gerasimenko from our Earthbound perspective through perihelion later this summer. “We are looking to bring an entire community of professional and amateur observers together,” said Rosetta Coordinator of Amateur Observations for Comet 67/P C-G Padma A. Yanamandra-Fisher in a recent press release. “When else can you observe a comet at the same time a spacecraft is viewing it at close proximity and escorting it to perihelion, and be able to correlate both sets of findings? 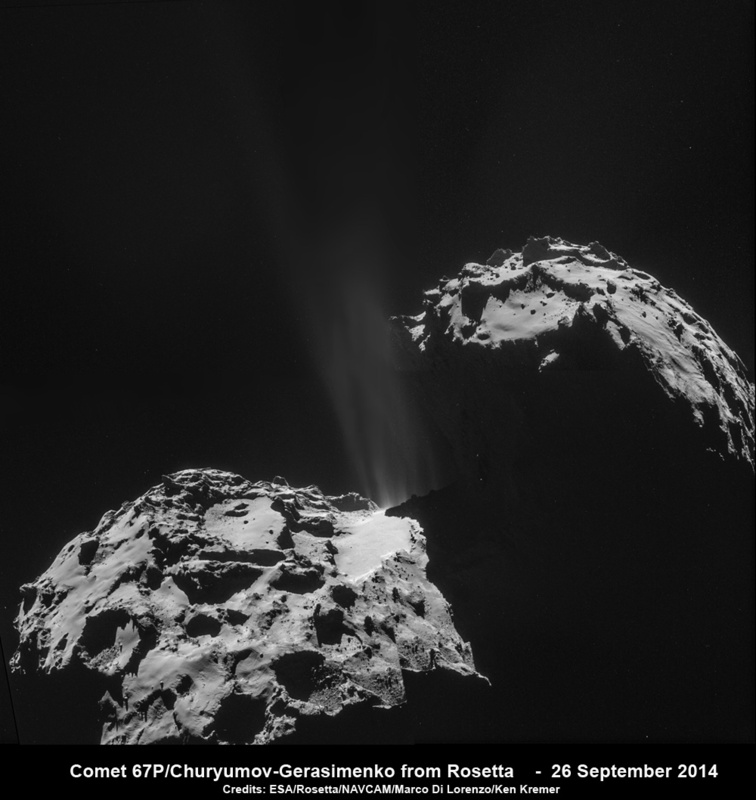 The Rosetta story thus far has been an amazing tale of discovery. We’ve extensively chronicled the historic approach of the Rosetta spacecraft as the rubber-duck-shaped comet grew in its view here at Universe Today. The world also held its collective breath as the Philae lander, the little washing Euro- washing machine-sized spacecraft that could, descended on to the alien surface. Heck, Philae even knocked a Kardashian out of the top trending spot worldwide, a feat in and of itself. 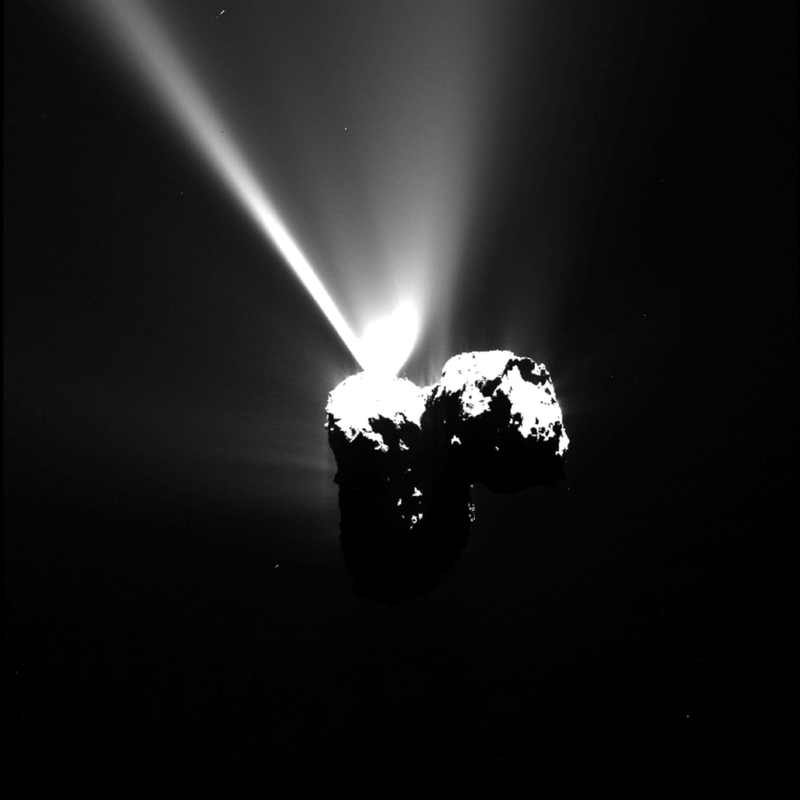 We also documented the Spinal Tap-esque “None more black” nature of the comet. Prospects in 2015: As of this writing, Comet 67P/C-G is 1.9 AU from the Sun and closing. The ‘P’ in ‘67/P’ stands for ‘short term (less than 200 years) periodic,’ and the comet orbits the Sun once every 6.44 years. Perihelion for 67/P occurs on August 13th, 2015 when the comet reaches a distance of 1.24 AU ( 191 million kilometres) from the Sun. 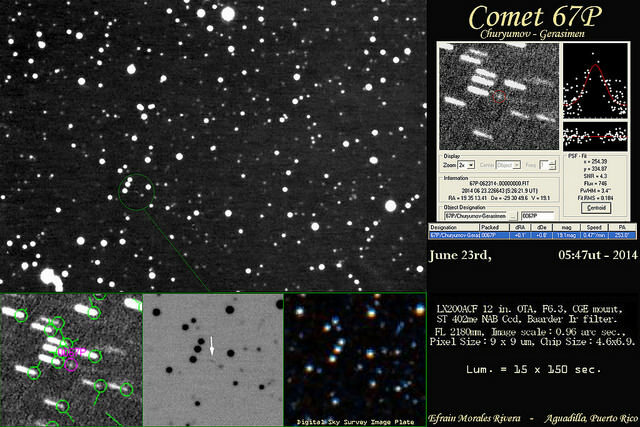 Discovered in 1969 by the Kiev University’s Klim Ivanovych Churyumov while examining a photograph taken by Svetlana Gerasimenko, this is the comet’s seventh apparition. Currently shining at +18th magnitude in the constellation Aquarius, Comet 67P C-G will vault up in the early morning sky for northern hemisphere observers and cross the ecliptic plane in the last week of July, at 43 degrees elongation west of the Sun. The comet is expected to reach a maximum brightness of +11th magnitude near perihelion. Historically, 67P – like most comets – tend to under-perform before perihelion, only to have an energetic lingering outburst phase post-perihelion. Time on professional scopes is always chronically in short supply, with more astronomers and targets to observe than there are telescopes available. That’s where amateur observers come in. 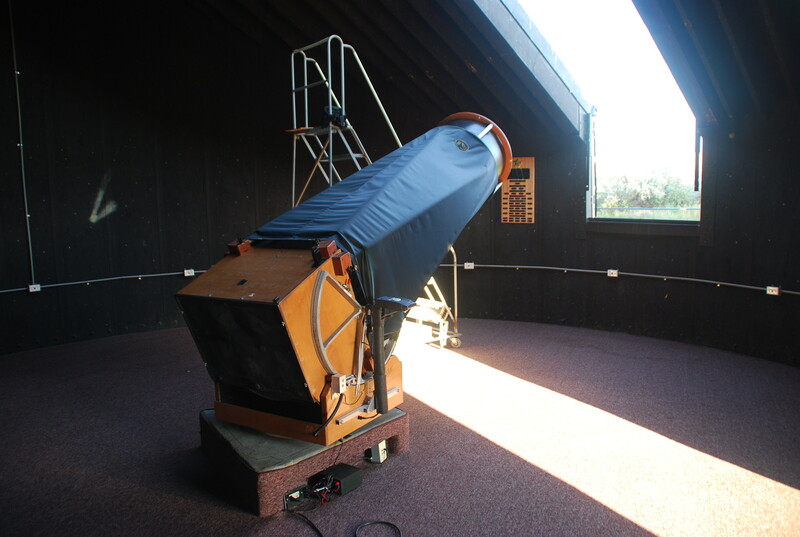 Many private backyard observatories have instruments that would be the envy of many a major institution. Though the press release suggests that the minimum aperture size needed to observe 67P this summer is 14-inches (35 cm), we urge 10” or 12” inch scope owners – especially those who have the latest generation of Mallincam and faint object CCD imagers – to give it a try. We’ve seen some amazing results with these, even during quick casual observing sessions such as public star parties! The Rosetta team is looking for everything from professional grade images, to sketches and visual observations with magnitude estimations. Of course, hunting faint comets is a daunting task at best. +10th magnitude is generally our cut-off for ‘is interesting enough to alert the public’ in terms of novae or comets, though we’ll let 67/P ‘into the club’ due to its celebrity status. To add to the challenge, the comet is only visible against a dark sky during a brief pre-dawn window. You’ll need a planetarium program (we use Starry Night Pro) to generate good finder charts down to 15th magnitude or so. Keep in mind, comets also typically appear a bit fainter visually than stars of the same magnitude due to the fact that said brightness is spread out over a broad surface area. ESA also has a great page with an ephemeris generator to help you in your 67/P quest. “This is truly interactive science that people of all observing levels can participate in- from amateurs to professionals.” Yanamandra-Fischer said in closing. Other comets to watch for in 2015 include still bright 2014 Q2 Lovejoy, C/2013 US10 Catalina, C/2014 Q1 PanSTARRS, and 19P/Borrelly. 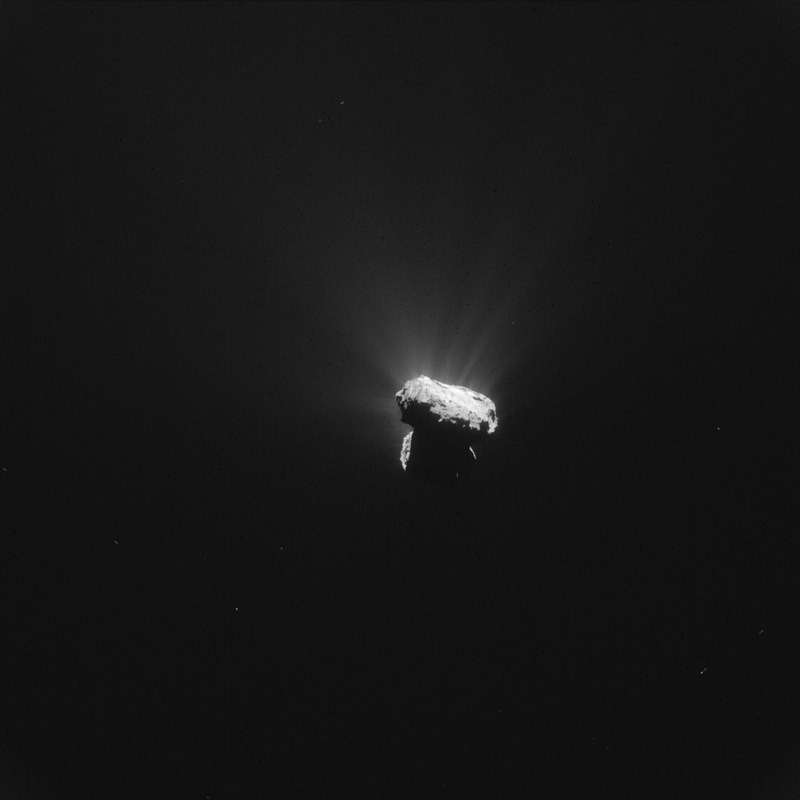 What’ll happen as 67P approaches perihelion? Will those two gigantic lobes crack and separate as Rosetta and the world looks on? Now, I’d pay to see that! 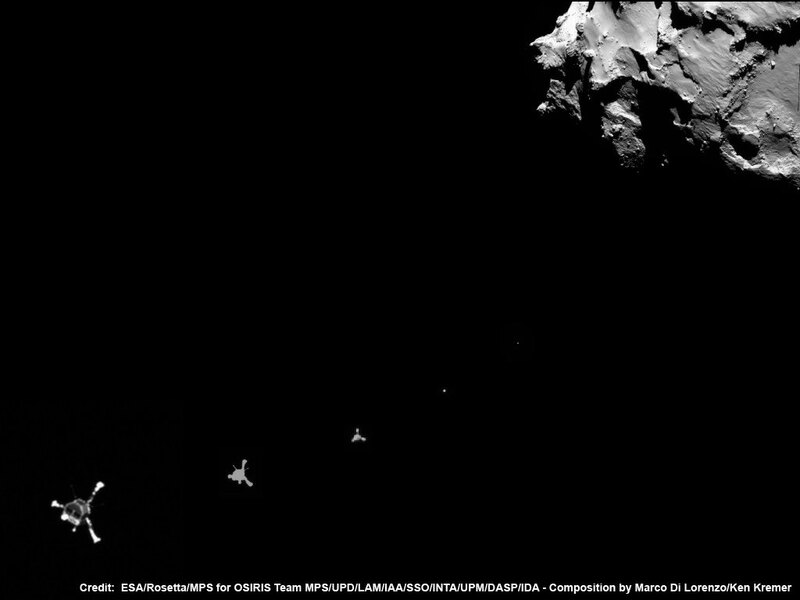 -Register for the Rosetta observation campaign here.